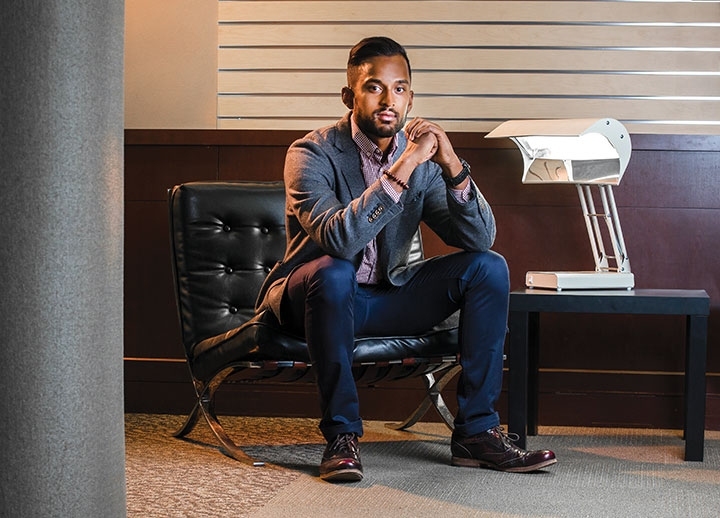 Why He’s Top 40: He improves the quality of life for people with developmental disabilities and mental-health issues, while also making Edmonton a little brighter in winter. In 2012, during his first winter in Edmonton, Robin Mazumder experienced symptoms of depression due to the shorter days and colder weather. While he had felt this way before, it seemed far worse, especially compared to how he felt growing up in Victoria’s milder climate. So, last year, Mazumder researched Seasonal Affective Disorder and bought a lamp designed to help with it. Then, he realized that the cost of the lamps (up to $300) was likely a deterrent for people who need help dealing with SAD. He applied to the Edmonton Awesome Foundation – an organization that gives grants to bring unique ideas to action – seeking funding for SAD lamps. He explained he wanted to put them in public places in the city. He received $1,000 in funding and currently, there are three SAD lamps in the Stanley Milner Library. Mazumder also focuses on quality of life for people with disabilities and mental-health issues through his job with Community Outreach Assessment and Support Team (COAST). That can mean doing something as simple as connecting a client with a suitable program. Mazumder realized how much he enjoyed working with people when he and a friend received a $10,000 grant to do development work in Eastern Europe. They travelled to Siberia and performed recreation-based programming for kids in the community. They held open-house sessions for parents with kids with disabilities.